I have seen this picture before and I'm guessing some of you have as well. There is a similar one floating around but I couldn't find it as I posted. Who else wants a life-size doll of herself as a wedding cake? When Chidi Ogbuta renewed her wedding vows, it wasn't so much getting spliced as getting sliced. The 35-year-old went that extra layer when it came to the cake – by ordering a life-size replica of herself. 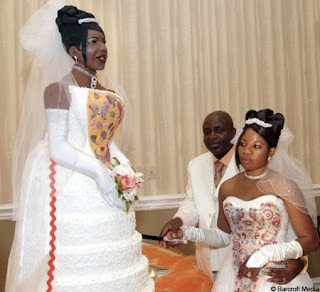 Mrs Ogbuta and husband Innocent , also 35, celebrated their ten years of married life with the 1.5m-tall (5ft) gateau, which was so big it took four men to carry it into the venue. 'Growing up, I always wanted a doll made in my likeness,' said Mrs Ogbuta, a mother of four. 'I told Innocent I wanted a life-size cake made in my resemblance as I would look on my wedding day. 'I searched for months to find someone who'd make my dream come true. Originally the plan was for two cakes – one of me and one of Innocent. The resulting butter-cream creation, which formed the centrepiece of the ceremony in Dallas, Texas, weighed 180kg (400lb) and contained 200 eggs and 7.5litres of amaretto.